Arugula and Quinoa Salad with Feta, Blueberries, and Pecans was born. I got it in one take, and it tastes delicious, and this post is going up just in time for TGIF tomorrow, and YAY! it’s a tiny personal victory between me and The Resistance. Take a hike, Resistance! Tiny victories are where it’s it; we’ve gotta celebrate them! And creating anything in the face of creative inertia is really a mighty victory, when you think about how powerful The Resistance can be. So pat yourself on the back whenever you get past it. It’ll probably be there tomorrow, but all that’s important today is that you’ve held it at bay for one more day. Please feel free to post any tiny or mighty victories you’ve achieved against creative resistance or the other baddie forces in your life in the comments field below, and we’ll all celebrate along with you! Back to the most important matter at hand here: the recipe for Arugula and Quinoa Salad with Feta, Blueberries, and Pecans. Considering that this is my fourth arugula salad this year (it’s obvi one of my 2017 obsessions) and that several of my salad recipes incorporate this lemon vinaigrette – and feta, too, while we’re at it – this Arugula and Quinoa Salad with Feta, Blueberries, and Pecans is not one of my most earth-shatteringly original ideas. But Perfect is the Enemy of the Good (There’s that mantra again!). And this salad is delicious, I must say. I mean, you can’t go wrong with any dish that includes fresh blueberries AND peppery arugula AND savory feta AND crunchy pecans – and QUINOA! Isn’t quinoa THE BEST in a salad? It adds this delightful extra something, this chewiness, this texture – not to mention, it’s doing its healthful beautiful quinoa thing by providing our bodies with ample protein and fiber and amazing vitamins and minerals such as iron, magnesium, and manganese. And fresh blueberries . . .. Fresh berries always feel like a treat to me when they work themselves into my diet. They’re generally not cheap, but their delicate tart-sweetness and antioxidant-packed power make them worth the splurge. And as we move into summer, they’ll be coming into season here in the Northern Hemisphere before we know it. I have only good things to say about ALL of the ingredients in this recipe, notwithstanding the lemon vinaigrette, which would brighten even the gloomiest of foods with its tangy, zesty sweetness. 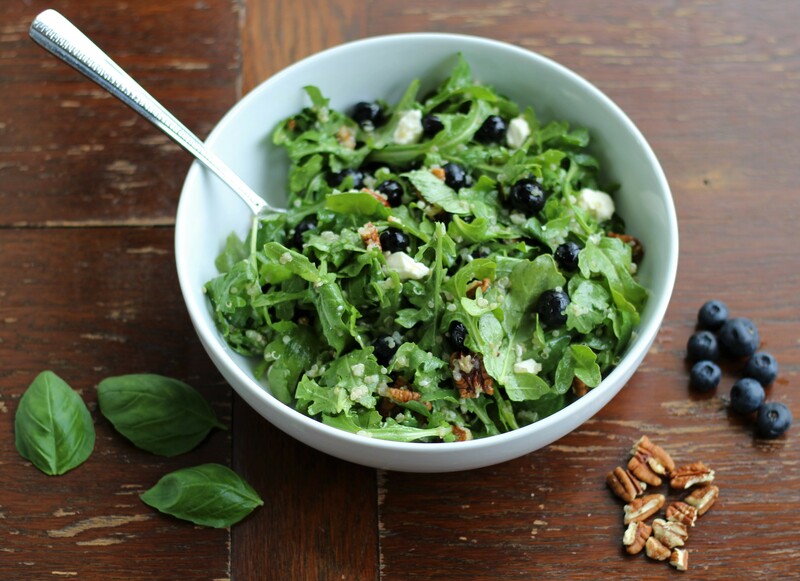 Yes, this Arugula and Quinoa Salad with Feta, Blueberries, and Pecans is a GLOOM-FREE-ZONE! OK, on to the recipe and sunny almost-summer-y goodness! 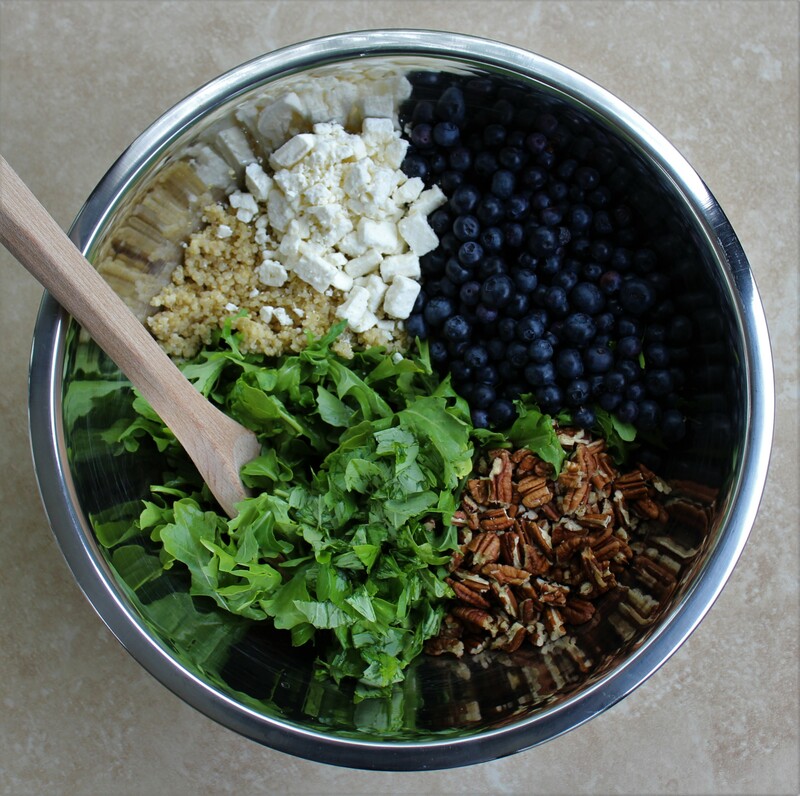 In a large mixing bowl, toss together the arugula, blueberries, cooked quinoa, pecans, feta, and basil leaves. To a mason jar or other similar such container with a lid, add the dressing ingredients and shake vigorously. Mix the desired amount of dressing in with the salad. And you're done! You have a beautifully fresh, healthful meal to enjoy.